I have spent a few hours knocking up a .txt file maker utility for E2B. You can drag-and-drop an ISO or other payload file onto it or select a payload file on the E2B USB drive using the File... button. Click on the Save .txt file button to save the text that is in the bottom text box to a .txt file in the same folder as the payload file. I will add this into the next E2B download, but it is available on the Alternate Download Areas as a separate download. Note: It does not read and parse existing .txt files. You can select a .txt file as the 'payload' file but it will not populate any fields from the existing .txt file. E2B v1.77h with AntiPanda NTFS bugfix! I finally managed to get the Panda USB Vaccine program to work by running it on Win10 as admin instead of XP and using the USBVaccine.exe /experimentalntfs command line! So I have been able to properly test the Antipanda.g4b and found a bug! I have updated the AntiPanda.g4b batch file in v1.77h and it should now work on NTFS volumes! where U: is your USB drive (run from an Admin command prompt) or use Disk - Properties - Tools - Check to fix it. AntiPanda running on an NTFS E2B USB drive. You must run chkdsk afterwards! Afterwards, you will have a \found.000 folder in the root which you can delete. If there is a file called \AUTORUN_.INF then you can rename it back to \AUTORUN.INF and it should contain the original E2B contents. P.S. I tested by using VirtualBox+DavidB's VMUB utility. This allows full rd/wr access to the USB file system and so the patches made by AntiPanda.g4b to the USB drive will remain even after quitting VBox. I have reworked the AntiPanda.g4b script and added another .mnu file. Note: NTFS bug in this version is fixed in v1.77h (you must run chkdsk /f afterwards!). The last .mnu file lists the partitions in the system and then runs the FAT and NTFS fix on the chosen partition entered by the user. This means you can 'fix' any system or USB drive by booting to E2B. Note that old versions of Panda converted the AUTORUN.INF file to an illegal directory entry for FAT volumes. This fix has only been tested on the more recent version of Panda v1.0.1.4. I have written a small grub4dos batch file (AntiPanda.g4b) which will attempt to fix both FAT and NTFS volumes (hd0,0) and (hd0,1). NEWSFLASH: New version (that works!) in E2B v1.77g or later! To use it, copy the .mnu file to the \_ISO\MAINMENU folder and the AntiPanda.g4b file to the \_ISO\e2b\grub folder. I will add this into the next version of E2B so that you can just copy the .mnu file from the Sample mnu folders file to one of your menu folders (e.g. \_ISO\UTILITIES). I have not fully tested this on NTFS volumes because Panda Vaccine USB is unable to actually work on most of the NTFS volumes I have! If you have an \AUTORUN_.INF file (with an underscore) then you may need to rename this to \AUTORUN.INF and run the fix before the drive icon will be restored. If you cannot rename the AUTORUN_.INF file, then just delete it. E2B v1.77f (Beta) is now available and includes these new files. The next version will include a .mnu file and new version of the AntiPanda.g4b that allows you to pick any partition in the system (in case you want to un-Panda any internal drives or additional USB drives). P.S. This won't work if you run it on a VM unless use either RMPrepUSB - F11 QEMU or VirtualBox+VMUB, because these allow full rd/wr access. Set one of the 'Reserved' attribute bits which makes Windows (and grub4dos) ignore it. This looks incorrect, but works because the grub4dos fat utility does not use the grub4dos filesystem driver and seems to ignore the 'reserved bit' that makes the file 'illegal'. After this code is executed, the AUTORUN_.INF file can be renamed to AUTORUN.INF. I have added a $Panda_RestoreAutorun.inf_FAT.mnu file to the Sample menus and also to the Alternate Download Area - mnu files folder. Just copy it to your \_ISO\MAINMENU folder to use it. You will only see it if there is no \AUTORUN.INF in the current volume. if exist (hd0,0)/AUTORUN.INF echo (hd0,0)/AUTORUN.INF now restored! if exist (hd0,1)/AUTORUN.INF echo (hd0,1)/AUTORUN.INF now restored! For NTFS volumes, it is a lot trickier as there is no grub4dos equivalent to the fat utility for the NTFS filesystem (see next blog post). If you want to try directly editing the NTFS filesystem to fix the AUTORUN.INF file, check the post by Vasily Ignatov Apr 29, 2013 at 3:19 AM here. This page on the E2B site describes 5 methods on how to add UEFI-bootable .imgPTN files to E2B that contain >4GB files. i.e. how to UEFI-boot from an NTFS image file. This is useful if your source contains a >4GB Install.wim or Install.esd file. I have recently added Method 5 to this page which describes how you can add a 2nd small FAT Primary partition to your E2B USB drive which contains Pete Batard's (Rufus author) UEFI-NTFS boot files (which I provide as an EFI_TOGO zip download file). I have fixed a few niggly bugs in the E2B_Editor utility and hopefully made it more intuitive to use. One problem was that on a 1600x900 screen, it defaulted to the 'borderless', fixed position mode. Let me know if you find any problems, otherwise it will be in the next release of E2B v1.77. Download from the Alternate Download Areas as usual and copy it to your \_ISO folder on the E2B USB drive. It is intended to be run from the \ISO folder of the E2B USB drive and any bitmap that is used should be on the E2B USB drive in the correct location already, so that the path of the wallpaper bitmap file that is saved to the \_ISO\MyE2B.cfg file will be correct. so it is obviously not going to work when you use it on your E2B USB drive! As an alternative to using the MOVE_IMGPTN.cmd Windows script, Switch_E2B.exe v1.09 now detects the position of the two partition image files (e.g. FRED.imgptn and FRED) on an NTFS E2B drive and if they are in the wrong order for UEFI-booting, it will offer to attempt to re-order them for you. It does this by copying the files up to 30 times and so it may take long time to do this, depending on the size of the files! Since the file without the extension needs to be last one, this is the file that needs to be moved\copied. If this is a large file, it might take a while! The re-ordering of the two files does not always work. If not, you can always try it again as it may work if you run it for a second time. Also, it may fragment the file (in which case you will need to run WinContig again and then try Switch_E2B again! Note that this version shows you if a second partition image file is present that has no file extension. It is available on the Alternate Download areas if you want to test it! Note: SWITCH_E2B was only intended for use on NTFS E2B USB drives. The 'Restore E2B partitions' button should work on any drive, but switching to any .imgPTN file will only work on NTFS-formatted E2B USB drives - exFAT and FAT32 E2B drives will report an error. Since the .imgPTN file needs to be first when using two partition image files and UEFI-booting on many systems, if SWITCH_E2B cannot move them, you could try just copying on the .imgPTN file, then defragging the whole partition (perhaps using Defraggler and WinContig?) and when all files are at the start of the volume, then copy over the 2nd file that does not have a file extension. 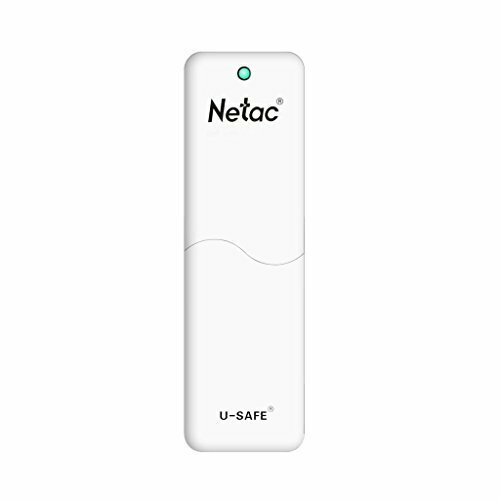 Today I got my new 32GB Netac U335 USB 3.0 Flash drive with a write-protect switch. The write-protect slide switch is ringed in red. The drive is not the fastest USB 3.0 drive I have ever seen (33MB/s read, 14MB/s write on a USB 3.0 port), but if you need a reasonably cheap USB drive with a write-protect switch then this would fit the bill. The MPI Tool Pack only contains an English menu.lst file. However, it does allow you to easily modify the files in the MPI Tool Pack to add your own menu.lst, background file and other files by using the CUSTOM folder. Processes the files on the RAMDISK to convert them for use with E2B, including modifying the menu.lst file, etc. I have experimented some more with my Asus Z87 UEFI system and .imgPTN files, and it seems that the firmware will not provide the user with the UEFI boot option to UEFI-boot from an MBR-partitioned USB drive, if the partitions on that drive are out of order. The Partition Table in the MBR (first sector) has 4 'slots' for 4 partition entries. (there are also some parameters for old Cylinder/head/sector addressing). Since about E2B v1.73, if the second partition is a small hidden type 21h partition that is placed there by RMPartUSB when you use RMPrepUSB or the MAKE_E2B_USB_DRIVE.cmd script, this partition is not removed when you switch to a .imgPTN file - this is only done if the extension is exactly ".imgPTN" or ".imgPTNAUTO". This was done because some Legacy BIOSes would recognise the USB drive as a floppy disk and thus fail to boot grub4dos and boot to the CSM menu unless a 2nd partition was present (e.g. some EeePCs). Windows File Download problems - virus detected! Windows 8/10 may not allow you to download files that it thinks are infected. .isoBF fixed (did not work in 1.75!). Zorin 9 persistent sample .mnu files added. Fix bug - if user deleted some of the Windows sub-folders (e.g. \_ISO\WINDOWS\XP) then the other Windows sub-folders were not enumerated. Fix 'Trouble!' message if installing XP and >1 internal drive in system. New grub4dos 0.4.6a version \grldr. Add warning if Write-protected E2B USB drive found. Improve MAKE_E2B_USB_DRIVE to detect Removable USB drives and set NOHELPER=1 in MyE2B.cfg for faster boot if using a Removable E2B drive. Elementary OS is a free download (you just enter 0 for Custom amount to pay - took me a while to figure that out!). If you actually like and use it though, please make a donation as requested. There has been a discussion on reboot.pro recently about how to write-protect a USB drive. It is not advisable to hardware write-protect an E2B USB drive because E2B needs write-access to the MBR (to modify it) as well as needing to modify other files (e.g. \autounattend.xml, etc.). Some WinPE's and linux's (via ISOBOOT) may be able to boot from a write-protected E2B drive though. I intend to investigate this further at a later date, to see just what is possible if the whole E2B USB drive is hardware write-protected. So the use of the write-protect switch on the Netac USB 3.0 U335 flash drive, for instance, is not a recommended option when booting from an E2B drive (although once it has booted to an OS from the flash drive, you could remove the USB drive - flip on the WP switch - and then re-insert it again and hope that it did not have enough time to get infected!). This example shows how to display a sequence of 26 bitmaps on E2B start-up. We can display bitmaps fairly quickly in grub4dos if we load them into memory first. This could allow us to display an animation sequence on first boot of E2B (move over Walt Disney!). The lines below can be added into a \_ISO\MyE2B.cfg file to show 3 bitmaps in a loop until a key is pressed by the user. It is assumed that the bitmaps have a black background and are each exactly 800x600 in dimension. Add the lines below to your \_ISO\MyE2B.cfg file (the first line should always be !BAT). Ensure that you have seven different .bmp.gz files in the \_ISO folder named Aurora0.bmp.gz to Aurora6.bmp.gz. I have added some files to E2B that will allow you to easily make and alter your own GFX Boot menus. It does not use a GUI, but is very easy to use. For more details see the E2B GFX Boot page.